Posted by wanda on Tuesday, June 21st, 2016 and is filed under News. 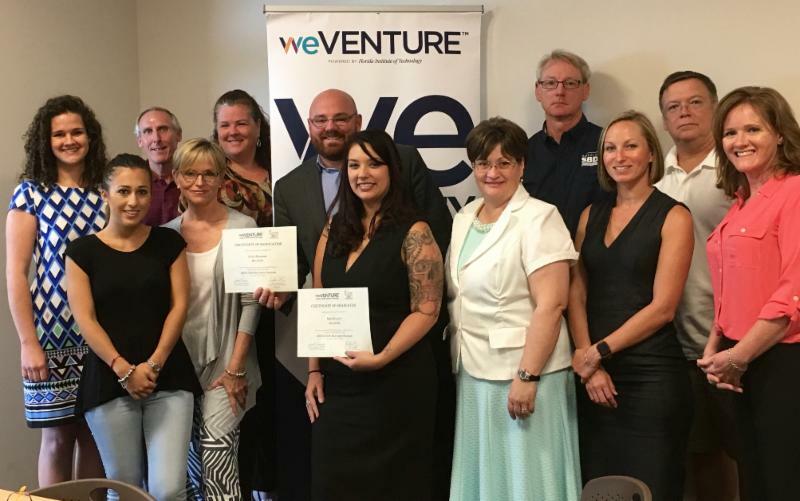 MELBOURNE, FLA. (June 21, 2016) – weVENTURE, a Central Florida-based organization launched at Florida Institute of Technology that’s focused on accelerating sustainable business growth for entrepreneurs, is pleased to announce that three Brevard County companies graduated from its IGNITE 360® Business Mentoring Program. Swanky Sole, owned and operated by Dawn Badolato, launched in July 2014. With the recent relocation of her store to Viera, Dawn took this opportunity to learn to develop a solid business strategy and reevaluate her growth plan by participating in the IGNITE 360 TRANSITION and ADVANTAGE programs. Millefiori Medical Skin Rejuvenation owners Kyle Graham and Iris Kelley participated in the spring session of the IGNITE 360 PREMIER program to further grow their boutique medical spa, the first of its kind in Brevard County, and transition to adding new services. ViaCloud Technologies, founded by Tish and Roland Calvert, is an SBA-certified 8(m) Woman Owned Small Business that delivers technology services and solutions to businesses and government agencies. ViaCloud participated in the IGNITE 360 ADVANTAGE program to learn how to construct a business growth plan. IGNITE 360 provides customized coaching and mentoring for entrepreneurs in all industries and stages of business, from at-revenue to emerging businesses to larger, second-stage companies. Program participants are matched with a select group of expert advisors who address current business challenges and determine strategic steps to reach desired outcomes. IGNITE 360 PREMIER for larger companies that are focused on transformational activities and gross more than $500,000 annually. To learn more about the IGNITE 360 Business Mentoring Program or to register, email[email protected] or visit http://weventure.fit.edu/mentoring/index.php. weVENTURE (formerly the Women’s Business Center), launched in 2007 at Florida Institute of Technology, accelerates growth for entrepreneurs by providing customized coaching, business education, mentorship and networking programs. weVENTURE has three Central Florida locations (Melbourne, Rockledge and Orlando) and is funded in part through a cooperative agreement with the U.S. Small Business Administration. For more information, or to register for weVENTURE courses and mentorship programs visit www.weventure.org or call 321-674-7007. Founded at the dawn of the Space Race in 1958, Florida Tech is the only independent, technological university in the Southeast. PayScale.com ranks graduates’ mid-career median salaries in first place among Florida’s universities, and lists Florida Tech among the top 20 universities in the South-both public and private. The university has been named a Barron’s Guide “Best Buy” in College Education, designated a Tier One Best National University in U.S. News & World Report, and is one of just nine schools in Florida lauded by the Fiske Guide to Colleges. In 2016, Times Higher Education ranked Florida Tech one of the top 20 small universities in the world. Florida Tech offers undergraduate, master’s and doctoral programs. Fields of study include science, engineering, aeronautics, business, humanities, mathematics, psychology, communication and education. Additional information is available at www.fit.edu.